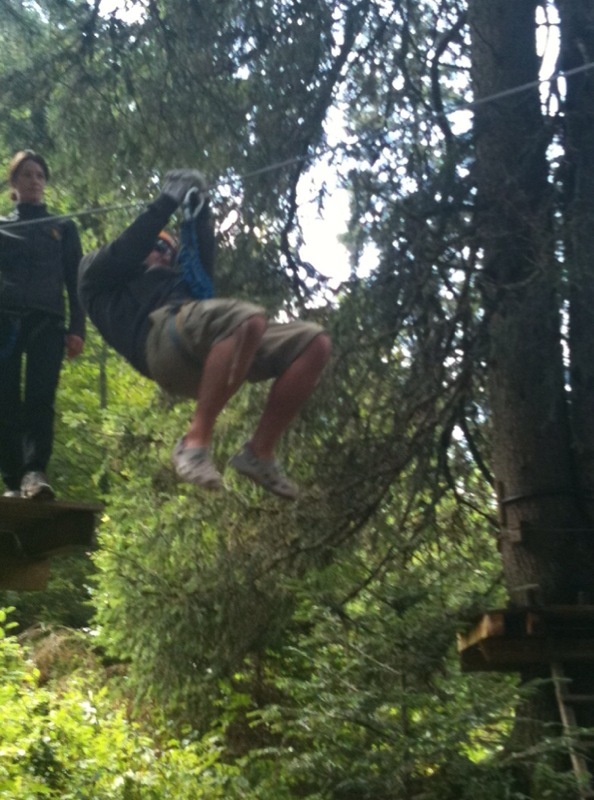 A week of interesting activities: Monkey swinging in heels and fly swatting. I’ve been a bit quiet over the last week both here and on the blogosphere in general as I decided to take some me time in honour of the French holiday season. So quite a disappointing weekend really. After a while the sun decided to come out and we went up the mountain to a monkey park. I say monkey park as it is an activity park where kids and adults swing from trees like monkeys. The French call this accrobranche (accro for acrobatic and branche for the tree branches). For ages I thought it was called aquabranche and had something to do with water. How very wrong was I! Needless to say I was not equipped: heels and palazzo pants aren’t quite the right the right attire for walking on a tightrope or swinging amongst the trees and nobody could care less that I had a swimming cossie and towel in my bag. Not being able to do anything and faced with waiting in the cold for hours (14 degrees!) whilst everyone perfected their monkey swings (how appropriate!) I was relegated to looking after the two year old and helping him around the kiddies course. It was not easy as I had to keep hooking him up and I think the other parents considered that I was a Mere Indigne (not a good mother) as after all, who would take their kid to a park dressed like I was? I must have been a funny sight as I tried to scramble up through the trees so that I could unhook and rehook him all whilst he was wailing or looking at me as if I was an idiot. On one part I got stuck and couldn’t get down, so there I was with a two year old stood 3 metres off the ground hanging by a rope and me, stuck. Thankfully a parent came to my rescue (or more so to the child’s) and helped me out, all whilst I was trying to explain that he wasn’t my kid and I had no idea what an accrobranche was! Thankfully we were able to complete the course unscathed and the little boy enjoyed it so much that he he looked up at me expectantly and asked if we could do it again. I told him that no doubt his Daddy would take him another time… I was not going to risk his or my safety anymore than required in one day! It was 14 degrees at the Monkey Park! After that we went down to the Beaux-Parents for a few days where the temperatures were stifling (39 degrees, what??) and I convinced my Mother-in-Law to teach me to make legumes farcies (one of my fave French dishes). She was very patient and spent a whole morning talking me through the family recipe – I didn’t realize it would take so long to make! You can see the recipe in my latest Expat Focus article here. So quite a funny week and oh yes… how could I forget? I quit smoking! Desperate not to pile on the pounds I have taken up a new hobby to keep me from nibbling or becoming anxious – fly swatting! 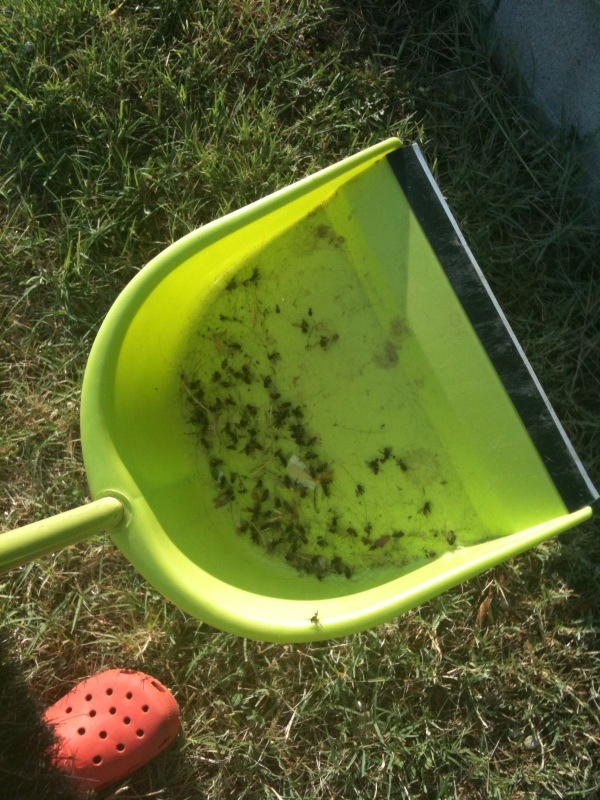 Seriously, at the BP’s I spent hours swatting flies. It’s like keep fit. 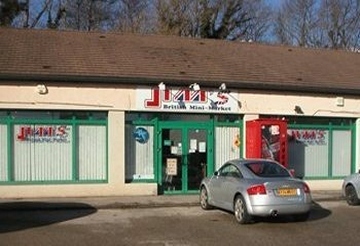 Keeps your mind off the ciggies, off food (essential) and gives you a full body work out at the same time! So far, the scales have stayed the same and I’ve managed to stay off the weed so to speak so all’s good. Cause for divorce – TomTom GPS? So, I’m back from Corsica and will share my adventures with you soon although I’m lucky to be back no thanks to GPS TomTom!! I often wonder how many marital disputes, family fall outs and accidents are caused by GPS’s giving wrong directions. All the men I know never listen to directions and will certainly never stop and ask for them and yet if I force the TomTom on them they’ll quite happily listen to the soothing voice of Jane (or whoever, I heard you can have the Simpson’s voices if you wish) and then follow her instructions without applying any degree of logic or direction. When affronted with a rubble road (think The Flintstones here) the Man (or in my case Hubby) becomes enraged and the angry swear words and obscene gestures are directed at TomTom and thankfully not at you. However, this means that the atmosphere in the car becomes heated, with much huffing and puffing, more angry gestures and then silence. Sometimes the misdirection’s from TomTom won’t matter and laughter will break the silence such as the time we drove through a field on the outskirts of Lyon only to be met by an intrigued farmer coming along on his tractor in the other direction. But it can also be the difference between catching or missing your flight. Going home or being stuck where you are, having to fork out hundreds of Euros (if not thousands in peak season?) to wait until the next available flight which may not be for another week. This was our case. We left Calvi at 11 am knowing that we needed to be at the airport in Bastia for 3 pm allowing us time to return the hire car and affront the huge queues typical of the last Saturday in July. I wanted to stop by Saint Florent on the way back and according to TomTom it only added 40 minutes to the trip, so in total we would be looking at an overall driving time of 2 hours 20 minutes. Perfect. Plenty of time to get there, to allow for traffic and even enough time to stop somewhere along the way and enjoy some more Corsican food and wine. All was going hunky dory until we left Saint Florent (this was probably due to the excellent sign posts though) and started along the windy, mountainous roads towards Bastia. These were not dissimilar to those we took to arrive in Saint Florent after leaving the main road, but after a while the pot holes were becoming bigger and bigger, until suddenly there was no road left and we were on a rubble track. Continuing along, convinced we were on a great short cut and were avoiding all the traffic jams, we passed a small hamlet and smiled smugly to ourselves as confused locals looked on in amazement at us bumping along the track in a filthy, dust covered so no longer bright blue, Peugeot 206 hire car. Is TomTom having a laugh at our expense? Yes – that is the road. 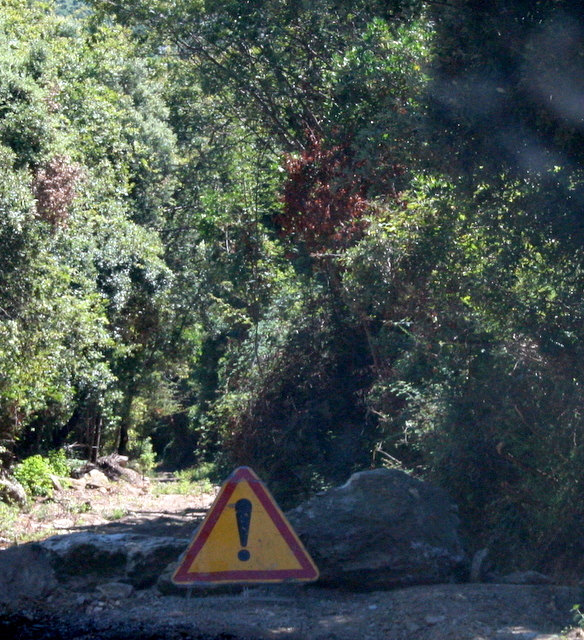 With the sign in the middle (and the big rock blocking all access behind). There was no way we could (or wanted) to continue further down this road. So rather bashfully we made our way back down the track, back past the villagers (who must be used to this sight and probably have their act of astonishment down to perfection) and then past a Parisian registered Mercedes hurtling in the direction we had originally come from – with a TomTom firmly affixed to his windscreen! Eventually, an hour later than we had wished for and with just 20 minutes to spare before check-in closed, we made it to the airport and managed to catch our plane home! Phew! With the intense heat of the last week and my crazy schedule it’s been a bit manic with not much time to blog! Last Tuesday I attended a wedding party of one of my first French friends I met when I was just 16 on one of the boats on the Saône river in Lyon. Despite living here for many years, a river cruise is something I had never done we were lucky that the day was so perfect for such an activity. The weather was just hot enough to spend the whole evening on deck, cruising along without feeling any chill whilst coiffing back champagne and enjoying delicately prepared nibbles from a well known traiteur (which I don’t know and need to find out!). I didn’t get chance to take too many photos as conversation was flowing and I hadn’t seen a lot of people on the boat for 10 years plus, but if you’re ever in Lyon it is definitely something I would recommend. Then last Friday I dashed off on a last minute business trip to Paris on what was to be the hottest day of the week and the last day of school for Parisian kids. What a nightmare! The heat in Paris was so intense you literally melted, I thought things were tough in Lyon where it is often hotter than Paris, but mix in the Parisian pollution, tall buildings and that many people everywhere and the heat feels far more intense. Whilst I was in Paris I was lucky enough to be able to meet up with Karin from An Alien Parisienne in a Starbucks close to Opera Garnier. It was great to meet Karin and it is a shame that she’s in Paris (or that I’m in Lyon) but I’m sure we’ll get other opportunities to meet up in the future. I’m sure Karin won’t mind but I’ve pinched one of the photos she took of us to share here (below). Karin was excellent in guiding me from the tube to Starbucks and then she kindly accompanied me to my meeting as I didn’t have a clue where I was going (I’d forgotten to take any maps, duh!). It is only thanks to her that I know I have seen the Opera Garnier now, I have often wondered what the building was! Another thing I have to thank Karin for is introducing me to Picasa for my photos – it’s great and I love it. 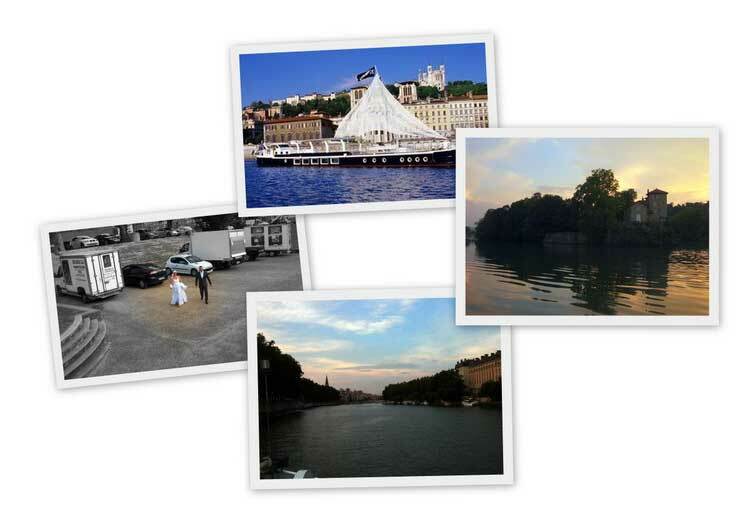 Picasa is another reason why I have not blogged this week! At the end after all my meetings, I was a melted, tomato sauce splattered wreck and wanted one thing and one thing only – to be back home. Alas, I was not going home tonight though, I was off to friends for a weekend! As I waited in the crowded Gare de Lyon with everyone who was going South, I started to wish for rain. This is most unlike me, but the heat was just so intense and with all the people standing waiting for their late trains it was extremely claustrophobic and I could barely breathe without touching other people as my lungs expanded. I ventured outside to try and get some fresh air before I fainted and was overjoyed to feel spots of rain on my bare arms. ‘Hurrah’ I though as I stood there embracing the rain. It was a short-lived sensation though, my train had been announced and the platform was the other side of the station – not an easy feat trying to cross Gare de Lyon during the peak traveling period like that! I have now made note never, ever to travel again by train during peak periods such as last day of school. 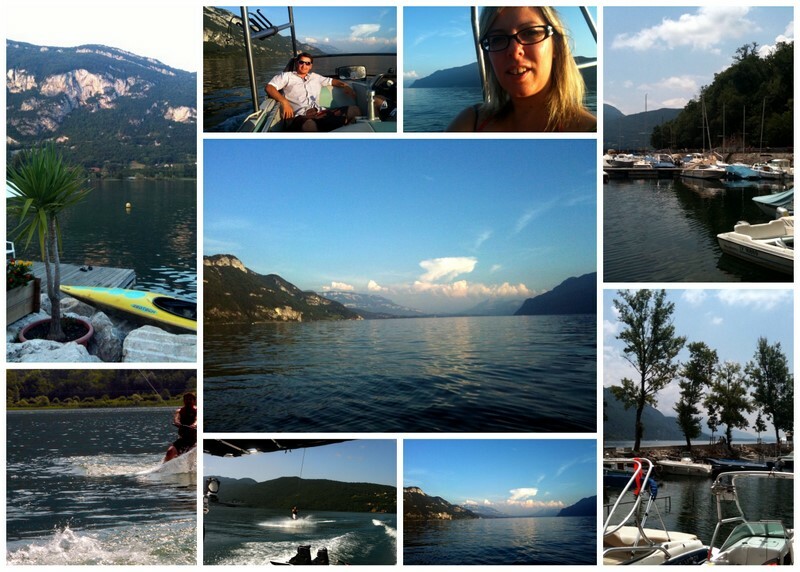 Saturday the hot weather persisted and I was unable to do much, but come Saturday evening I had a new lease of life and we enjoyed a boat trip with friends around Lac de Bourget near Aix-Les-Bains. Now, this is somewhere I would love to live if I ever left Lyon… I did get one of those free property magazines but I don’t dare open it and look just in case I see somewhere I really like the look of as I think I may just be tempted! Aix-Les-Bains is only an hour or so drive from Lyon and it is a fantastic thermal spa town sitting on the Lac de Bourget. We weren’t staying in Aix itself but in a nearby village at one end of the lake. I love being around water when it’s very hot and I can say that we definitely appreciated being on water Saturday evening and most of Sunday as temperatures soared past 34 degrees celsius. Where would you like to be during this heat wave? 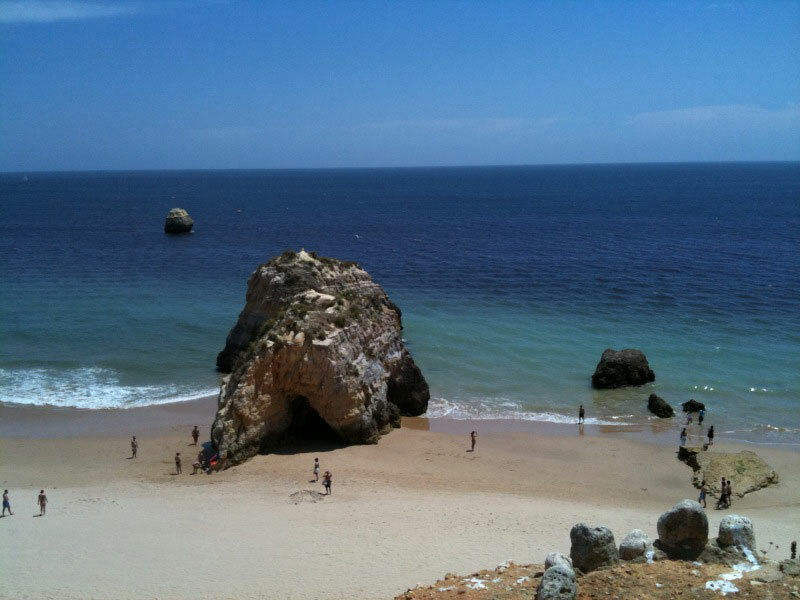 Ahhh… I’m back from another week in Portugal, nicely relaxed, fairly tanned and with more weight around the midriff… My holiday mostly consisted of eating, drinking and doing nothing which is absolutely perfect! Of course, there was a certain amount of football as my Dad is a huge footy fan and I have to say even I enjoyed what I watched. I was glad to be abroad when France got knocked out, it must have been havoc in the city – I wonder if any cars were burned (car burning is a common French occurrence when youth are discontent with things)? I feel sorry for France though, politicians have become too involved in their sports and they are a good team even if their behavior was disgraceful. They did represent their country well by going on strike though didn’t they? As for England, well, bitterly disappointing but then I think I hear that at every sporting event – never live up to expectations. So my dreams of watching an English or French Final on big screen TV in the city square as I did in ’98 (albeit not in Lyon) have been dashed. Who knows who’ll get the final, I think Germany (it wouldn’t be as bitter if we lost to the finalists) or Brazil but I will leave predictions to the specialists as I don’t know anything! 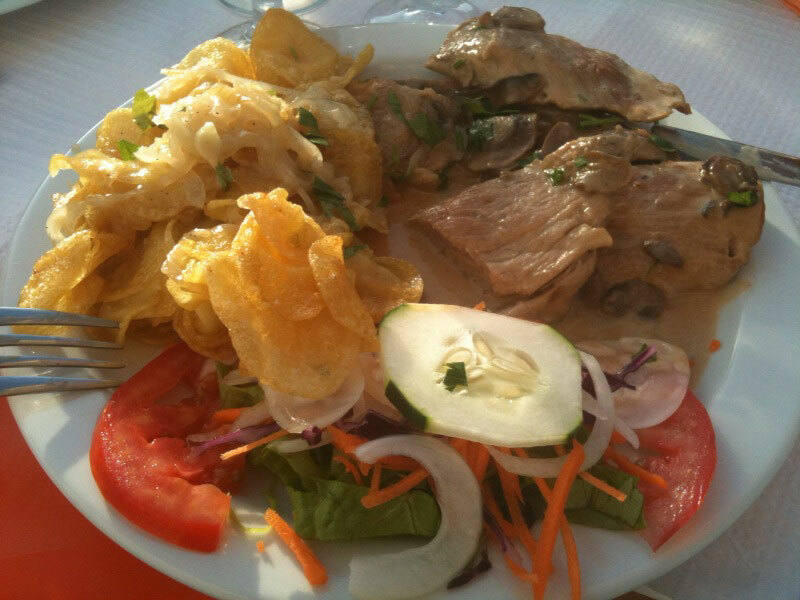 I also savored some Portuguese cuisine, although after 4 years of regular trips to Portugal I have to say that their cuisine is nothing special and normally consists of grilled meat or fish, limp salad with no dressing and chips. Fish is also quite expensive and generally has a very fishy taste which I’m not too keen on (okay, so fish should taste of fish, but sometimes for me it tastes too much of fish – are you following?). Due to the extreme lack of variety in Portuguese Cuisine, I like to eat at my Mum and Dad’s rather than going out for a meal; fresh salads, BBQ or good comfort food and dishes from my childhood such as Shepherds Pie. 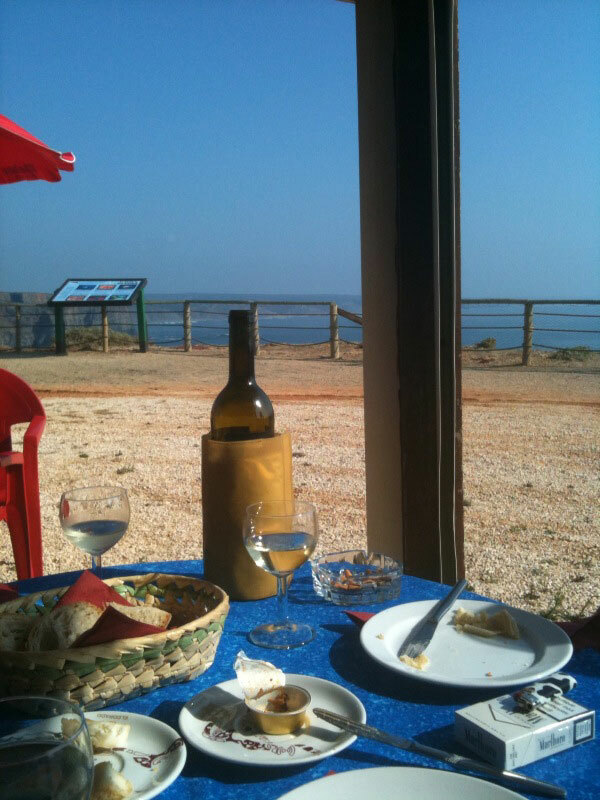 On one particular day we were enjoying a glass of lovely Portuguese vino overlooking the beach and decided to make the most of the excellent weather and stay for dinner. I chose Pork Medallions in a mushroom sauce with chips and salad. When the meal was served I was surprised to see I had been given Crisps with fried onions on them! Chips in French does mean crisps but I had never been given crisps in a restaurant in either France or Portugal before so I was gob smacked to be given crisps as part of my meal!!! The pork was actually nice even if it was undercooked in the middle and the salad was much fresher than what I’d become used to. However, the fried crisps and onions were just disgusting, as bad as they sound. 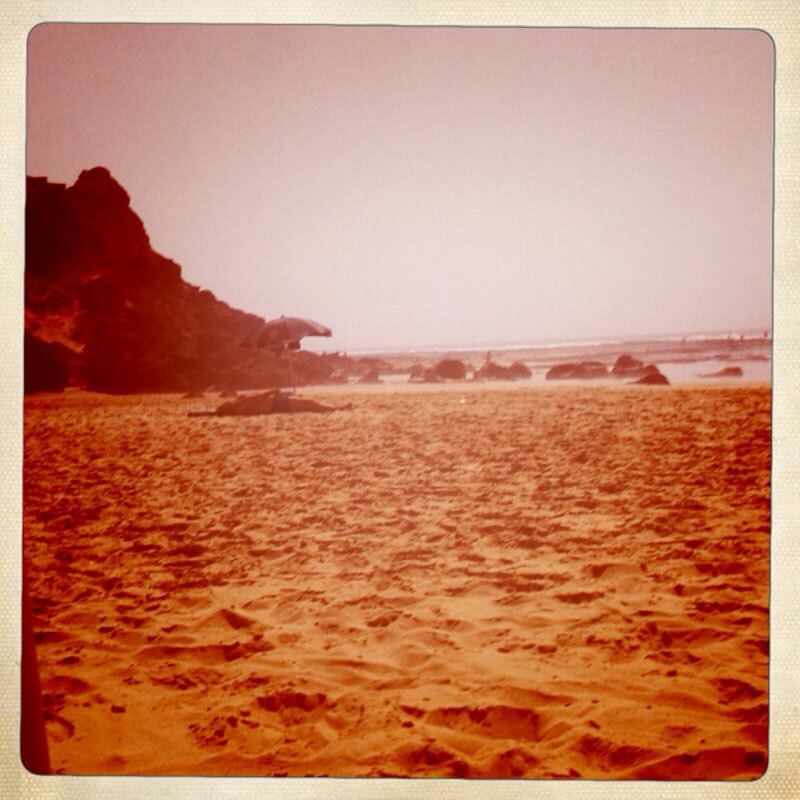 Talking about the beach, one day I was on the beach playing with my new IPhone app and was trying to take some artistic photos. 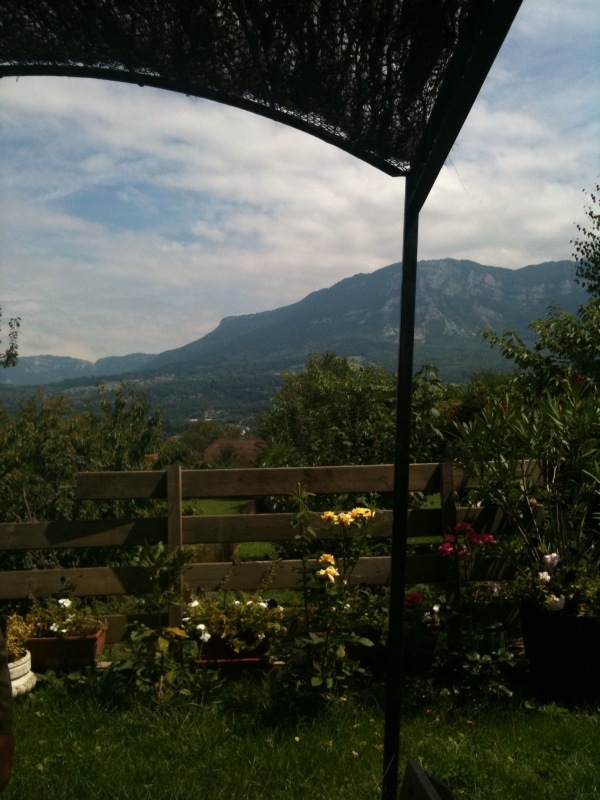 Through the little lens of the application, I spotted a parasol and though it would be cool to include it in the photo. I hadn’t spotted the man underneath it with his hands down his swimming trunks! YUCK! The beaches around where my parents live are quite remote so you often get the odd nudist and exhibitionist but this was taking things to a whole new level. I think he may have heard my exclamation when I looked up, as shortly afterwards he was laying on his side with his leg up in the air and striking poses!!! 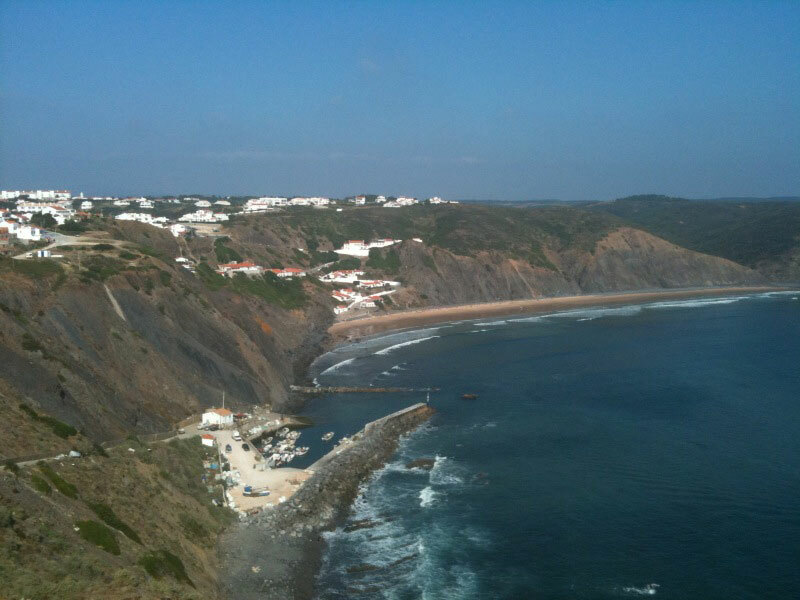 My favourite time on holiday though has to be the end of day aperitif with bread and cheese, sardine paste and chilled white wine overlooking the glistening sea near one of my favourite beaches. Paradise! I was pretty ill (again) before going on holiday – I had caught a chill with the dreadful French weather and it had gone to my sinuses. What a delight it is to return to gorgeous weather in France, it’s been a long long time since I haven’t been able to say that so I hope it’s going to be a long time before I moan again. Last Saturday I was praying for the Volcanic Ash cloud to stay away and yesterday I was praying for it to come back so that we could stay in our Paradise for a little longer. Unfortunately it wasn’t meant to be and I am now consoling myself in the Lyonnais sun, knowing that I’ll be going back to the Western Algarve in just 4 weeks so I’m now back to hoping that that Icelandic volcano that no-one can pronounce stays away again. I’ve unpacked and have spent the morning wondering how men can travel so lightly? How on earth do they do it? I was quite proud of myself last week when packing, as my pile of clothes on the bed waiting to be packed appeared to be quite small compared to what I had been used to packing over the years. I congratulated myself thinking that my sailing trip last winter where our baggage was restricted in size and quantity had done me some good. Maybe, but not as much as Hubby! He put me to shame and my pile seemed like a mountain next to his little hill. I was so worried that he really hadn’t taken enough clothes and had forewarned my Mum that we would need to do some washing. He had packed 1 swim shorts, 4 t-shirts, 4 shirts, 1 pair of shorts, 1 jumper, a pair of Crocs and had jeans which he was travelling in. I on the other hand packed 4 dresses, 2 bikinis, 7 tops, 2 pairs of trousers, 3 pairs of shoes, 2 beach wraps, 4 jumpers/cardigans plus the clothes and shoes I was travelling. This really didn’t seem like a lot and I definitely had plenty to wear, but unpacking the suitcase now I’ve realised that half of it has gone unworn! I was never a Girl Guide but did go to the Brownies a couple of times so could it be them that trained me to pack for every eventuality? 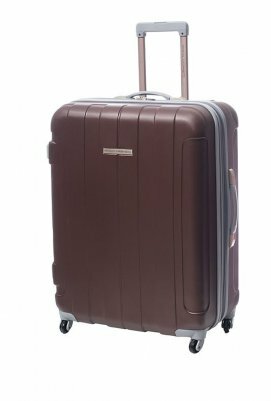 Our suitcase weighed in at 25 KG so I’ve made a mental note to myself that if I ever travel Ryanair I will have to get Hubby to do my packing, otherwise my excess baggage charges may just be as much as my ticket! Thankfully we were travelling Easyjet so no problems, how I love Easyjet! What really annoys me though, is that I had left a load of my toiletries in Portugal to save weight in the suitcase and to save me having to pack them again in 4 weeks time. Shampoo, conditioner, sunscreen… you name it, I’ve left it there to make more room in my suitcase (for more shoes maybe?). I was seriously regretting the sunscreen this morning though as I’d vowed in my quest against ageing never to go in the sun without adequate protection again and to my horror, this morning I realised that I had left all my sunscreen in Portugal bar my special factor 50 face cream! When we arrived back in Geneva yesterday, I remembered that there was a British supermarket not to far away so I convinced Hubby to take us there on the way back to Lyon. Battling with TOM TOM who did not appear to want to go anywhere, yet alone a British supermarket we eventually made it there and I entered into English heaven as I explored the aisles of food and delights. I noticed how brightly coloured all the packaging was compared to French supermarkets and everything just seemed to scream BUY ME, YOU CAN’T LIVE WITHOUT ME! I was shocked by the prices, everything was so expensive but compared to some of the websites some people here had suggested at least I wasn’t having to pay excessive delivery charges and I suppose that Jim (whoever he is) had gone to the trouble of getting all this to France to start off with so given the price of petrol these days and the fact that he is a French business, mark up does have to be high for him to even begin making a profit! Anyway, not put off by the prices I indulged in several items such as proper bacon, tomato and onion relish, sticky toffee pudding, Kettles Crisps (how good are they compared to the skinny Lays crisps in France! ), Angel Delight, Lazy chilli and my favourite, a chicken and mushroom pie amongst other items. 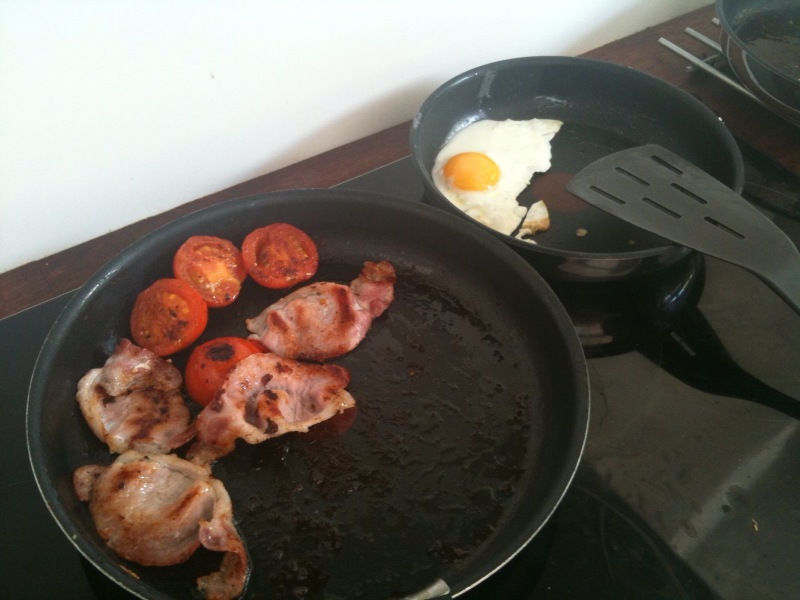 So this morning, not only am I sitting in the sun all relaxed and covered in sunscreen, but I’ve also enjoyed a somewhat English breakfast of bacon, egg and tomatoes! 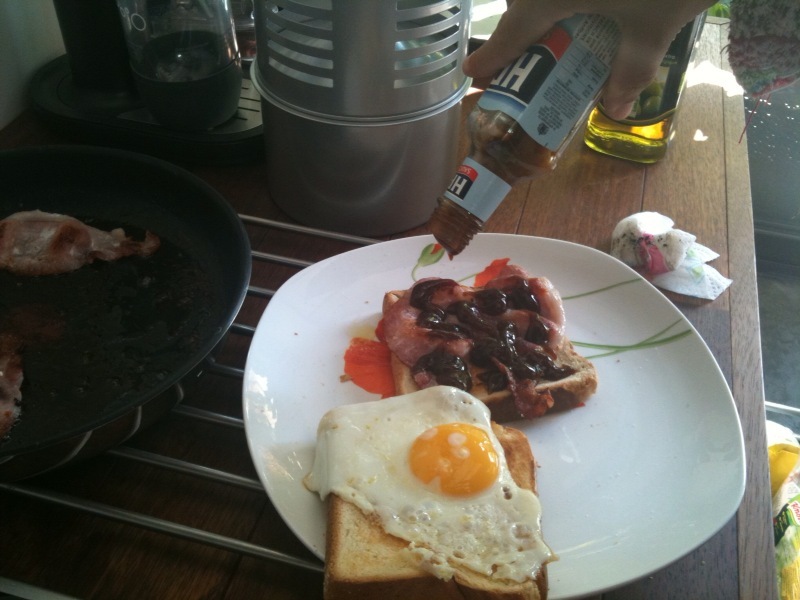 More yummy - with delish HP sauce! Now I think I’ll have a go on the Google Pacman they’ve set up to celebrate Pacman’s 30th anniversary – you can actually play it by using your arrow keys, quite addictive! Gosh, who’d have thought I’m nearly as old as Pacman? I hope I haven’t aged as much as that game has! Fancy a job ? Earn £750 as a sun creamer! Or should I say, screamer! I mean this is a total scream isn’t it? Given that most summer jobs in France are low paid, the possibility of earning £750 a week to rub sun screen on peoples back on the beach is amazing! I stumbled upon this article on The Telegraph website a few weeks ago and it has been in the back of my mind ever since. 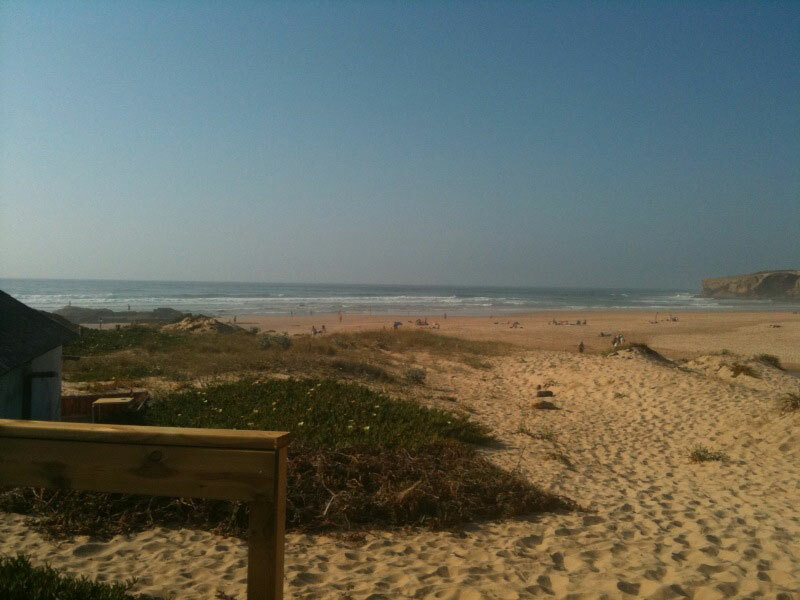 Apparently, the seaside resort of Les Sables d’Olonne is looking to employ one man and one women to apply sun screen to beach goers during the peak six week holiday period. That’s £4500 for 6 weeks work, not to mention just working 35 hours a week. Way more than I ever earned in a student job! Not that I’d ever have wanted to spend my holidays rubbing sun screen into peoples backs! EURK! That would be so gross, I’m totally grossed out just thinking about it. Anyway, for those that are interested, you have until 26th May to send a CV and video in which you need to explain why you would be good for the job! Not only did it rain, it poured! My streak of bad luck continued last Friday as we left Lyon with bright blue skies to arrive in Lisbon in absolute pouring rain. It was absolutely tipping it down and anything remotely tourist related was impossible without getting drenched. 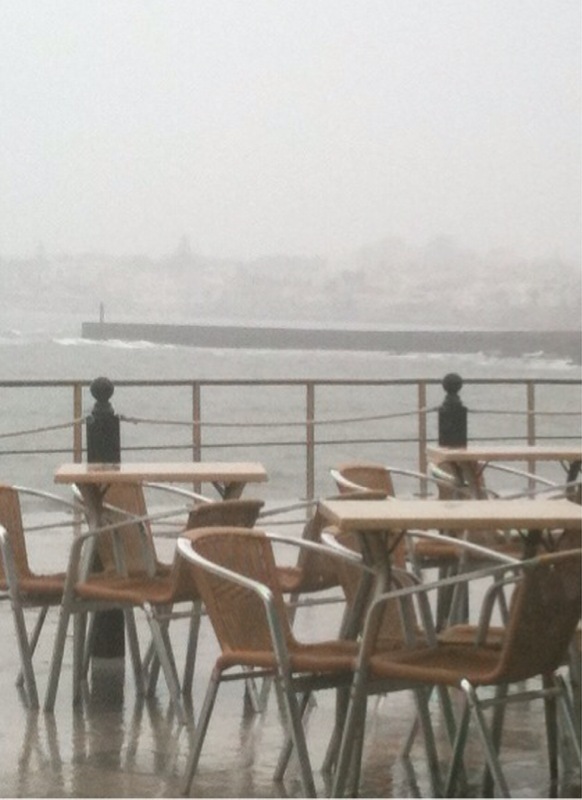 We found a small café on the promenade at Estoril and stayed there for ages, taking our time to eat and drink in the hope that the rain would go away. What a fantastic view we had! Thankfully it brightened up on Saturday and we were able to visit Lisbon properly although we had just one day. I was able to take lots of photos although not with my own camera as my battery was dead! Arggh! The weather is really strange at the moment as when we arrived back in Lyon on Sunday it was snowing! Again! We are in March! It never snows in Lyon, not normally anyway. It also snowed in the South of France and there were horrendous queues on the motorway. 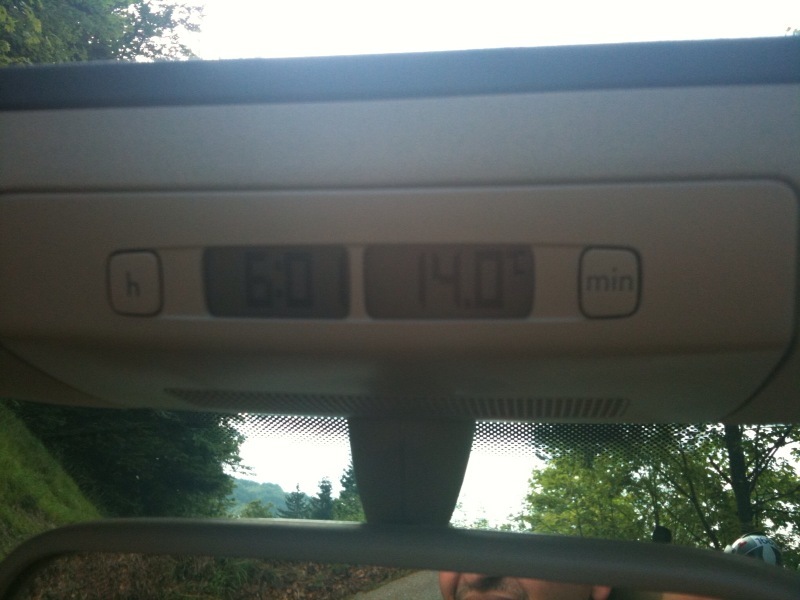 My cousin in law took 11 hours to drive from Lyon to Montpellier… so I was lucky to be in Lisbon in the rain after all! If you read French just take a look at this article . I just love the photo of the snowy road! Keep up to date with all the latest Piglet news!